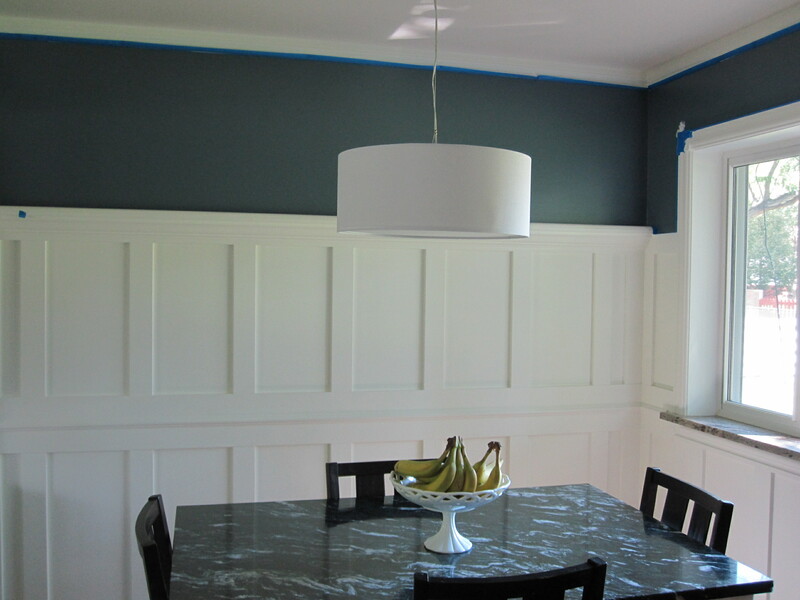 Over the weekend, we decided to repaint our dining room, completing the transformation. We used the same color as the basement, which extends up the staircase and is visible from the living room, dining room, and kitchen. I cleared the room and taped off the trim while Ben was at work. After removing the curtains, I decided that I liked how open the window looked. So, I took the outer curtain supports down, patched the holes and sanded it smooth. I don’t have much time to paint with a three-year old and four-month old. Fortunately, Ben is a quick painter and the area is small. It literally took about eighteen minutes to repaint. Here he is, hard at work. We had to do two coats. One on Saturday afternoon. And another on Sunday morning. Ben hung the curtain brackets about 5 inches from where they were. It’s really amazing how much more open the window seems now. I love it. 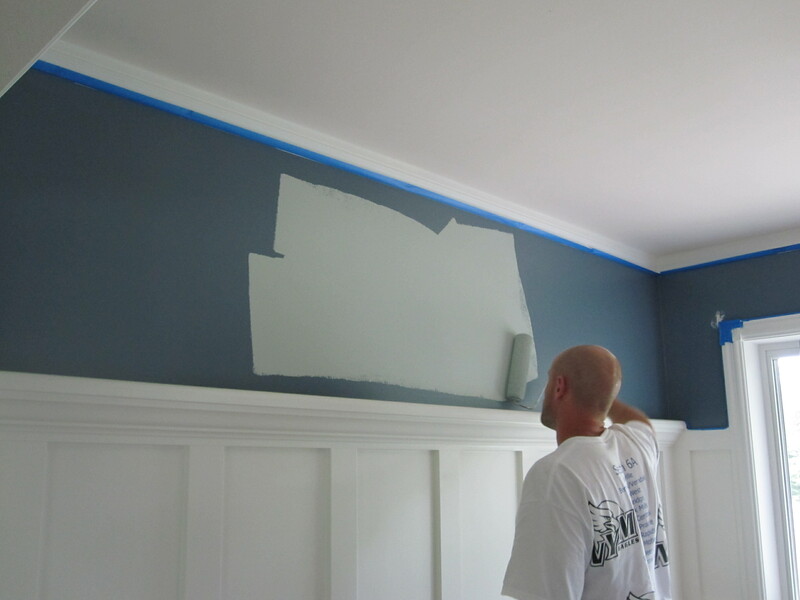 I did love the old, dark blue color (Benjamin Moore’s Hale Navy), but this definitely fits in with the rest of the house. The curtains are more fitting with the wall color, too. 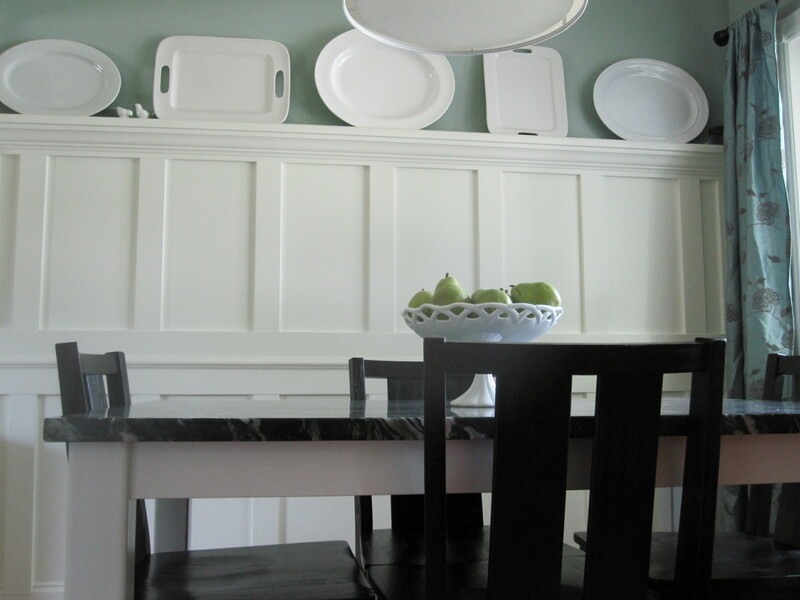 Sure, the plates don’t pop as much against the new wall color, but the dark table top was just too dark with the old wall color. The room has come a long way in the past few years. Now it’s exactly as I had imagined. 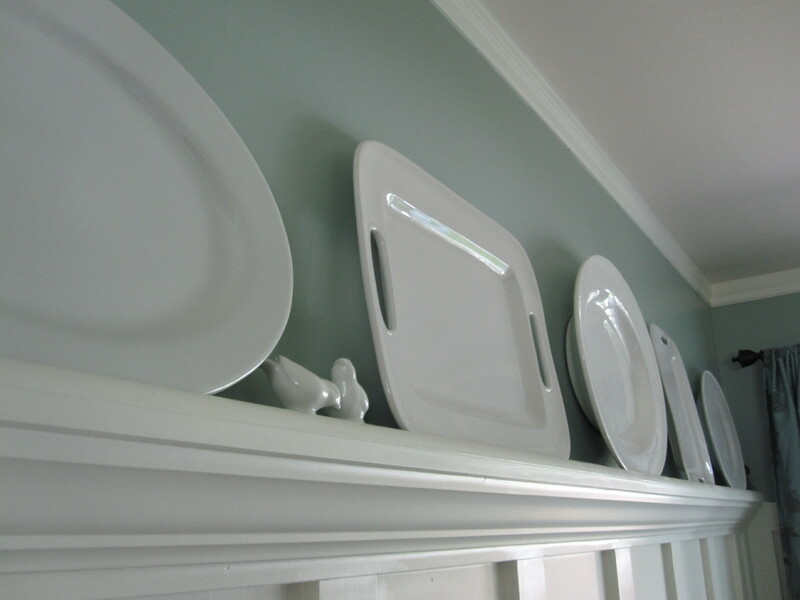 The plate rack is a nice feature, serving as art and storage. We have some touch up paint to do, especially on the white, but it’s good enough for now. I’m a happy camper. Touch up paint can wait. Let’s take a trip down memory lane, shall we? 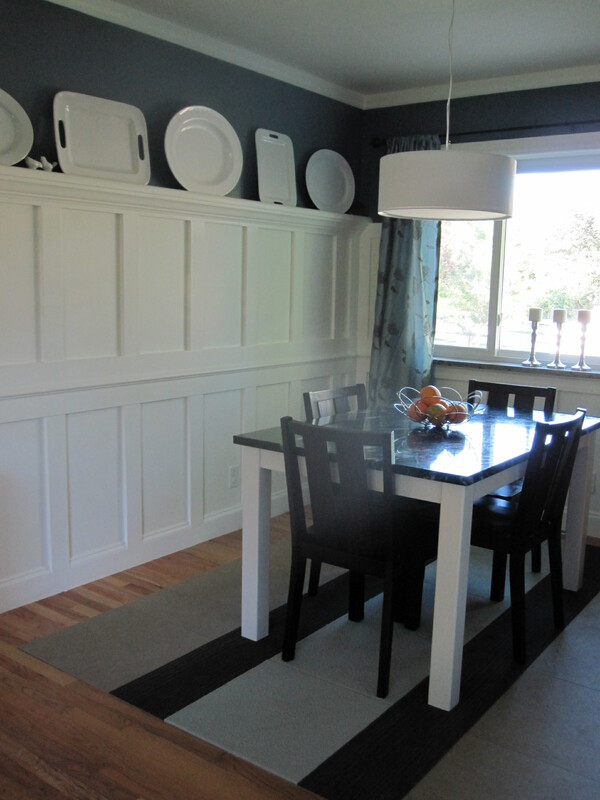 Here was the dining room as I received it, thanks to Ben’s decorating. Do you have any projects to take on this weekend? Previous Window Shopping: Cute or Kitschy? What a great transformation! I love, love, love that drum light. Thanks, Shannon! It definitely adds a modern touch to the space. Love the new look! Will you share what color it is? Beautiful job! 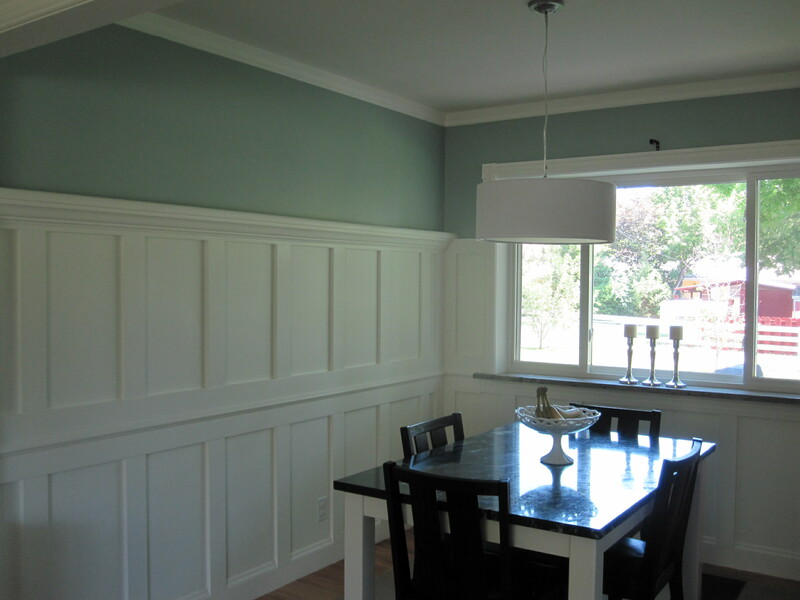 Love the new color and I agree that it really complements the style of the rest of the house. I really adore the new color! And when you look at the overall beginning to end transformation, it is quite jaw dropping! Found you on younghouselove. I LOVE this dining room! Great before and after. I’m glad you found our blog! 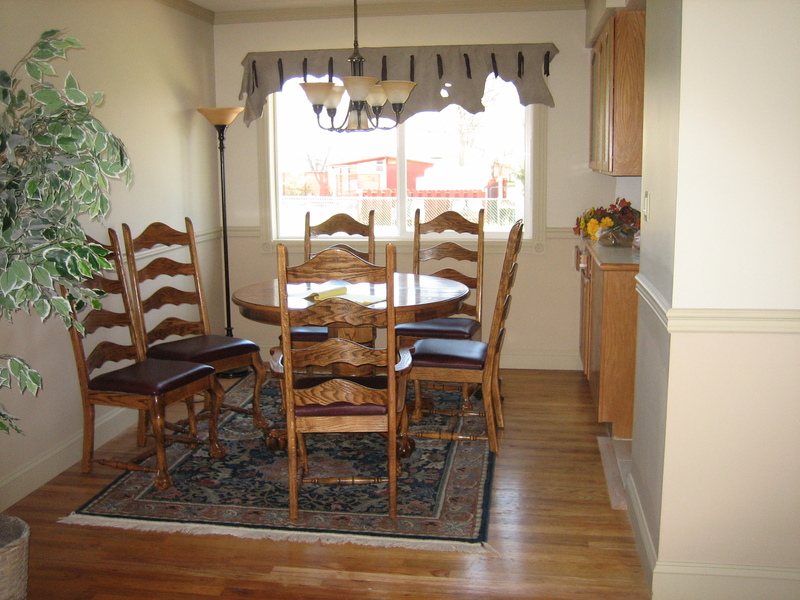 Thanks so much for the kind words about our dining room! oh I love the diningroom!!!!! THe plate rack is amazing! 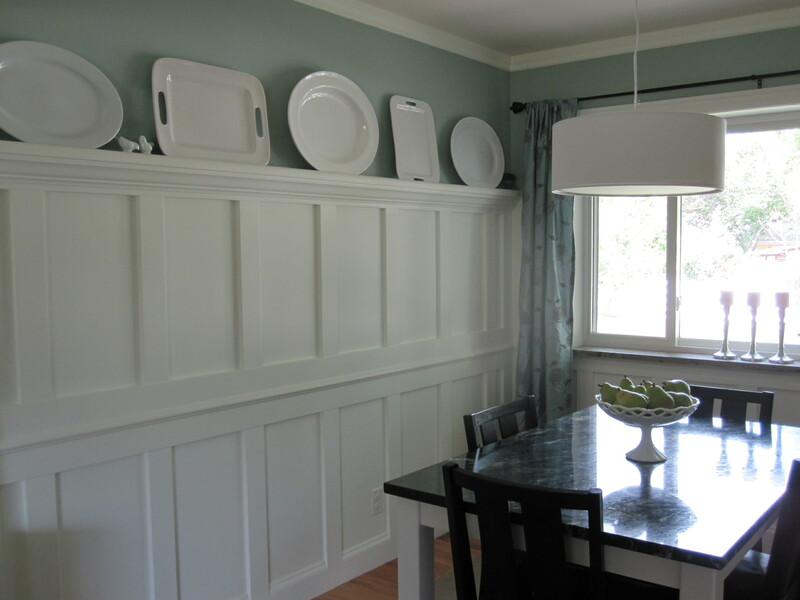 I love the trim and plate rack…is there a tutorial on that? Yep, here’s a tutorial: http://ourhumbleabowed.wordpress.com/2010/08/10/how-to-update-a-room-with-trim/ It’s actually pretty simple. If you give it a try, I’d love to see pictures. Can Ben come and add that trim to our walls, too??? It looks amazing! Love that color as well, showcasing the simple but beautiful white platters and plates. Great job! Your updates are stunning! Where did you get the rug? Thanks so much! The rug is actaully a mixture of FLOR tiles. The blue ones are Toy Poodle in Seafoam, the dark brown are Easy as Pie in Earthen (cut in half, going the direction of the stripes) and the tan are Fedora in Oatmeal. Hope it helps!! You’re very welcome! Thanks for stopping by!! Looks great! 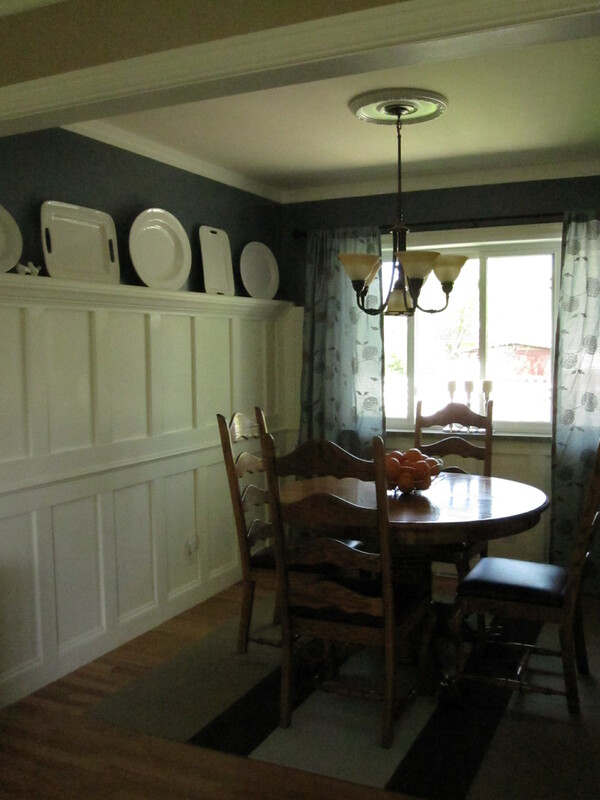 My dining room is a dark blue too and I loved it until I saw yours – now I want to lighten it up! I like the old color, but I like the new one, too. I love the plates and the light fixture! Just simple and lovely. What a change from the before! I liked the old color for over a year, which is amazing, but when we added the dark marble topped table, we really needed to lighten things up. That, and we had left over paint from our basement. I love that we lightened it up. 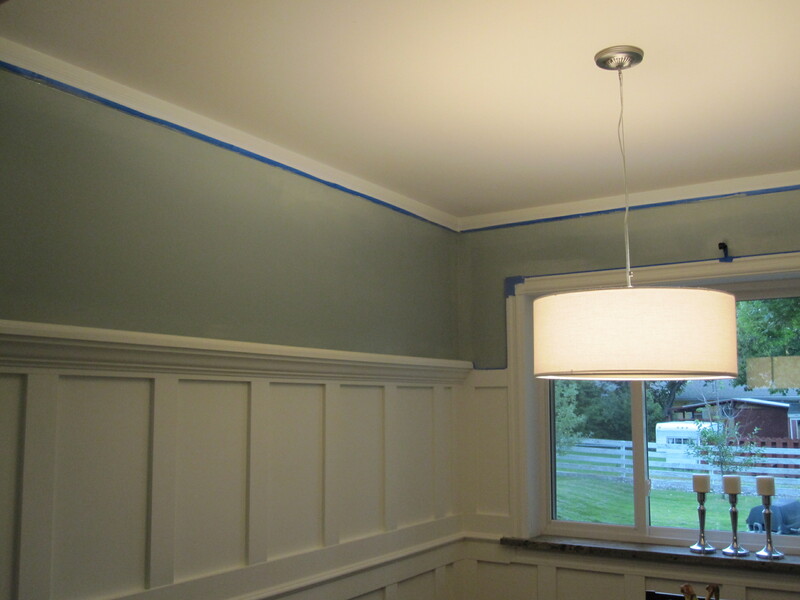 The dark blue was a nice change of pace, but overall, it didn’t fit with the other colors of our house. And the marble was dark enough.